Since you appear to need a host machine to run it, what’s different than running synth software on the host? I would guess the latency is really low. FYI the STM discovery board board pictured (MB1035B) doesn’t have audio output. You’ll be wanting something like the MB997C. That has a codec and an audio spigot. it seems like the picture used for this article is wrong. The linked project page explicitly states the project requires the NUCLEO-F746ZG or NUCLEO-F767ZI and shows one of those. The STM32F7 that is on those has a 12 bit DAC which is used for the project. “virtual analog” is just another confusing term to add to my vocabulary. “Part of the problem with getting involved in a new hobby is the cost” hmmm… doesn’t that count for anything! And offcourse now there’s something new that isn’t free but waaaaaaaay cheaper then the real thing. Why not emulate the whole thing on a PC, just software, completely virtual and when combined with virtual reality glasses it would be even more realistic. And if it was open-source or perhaps a pirated version of that same software well then it would cost nothing at all. Cost, should never be the reason to stay away from any kind of hobby, if you really want something, you’ll find a way, not being able to do/get something sometimes makes people more creative and in most cases respect the hobby for what it is. You can see it as a sort of filter, if you get past it then you are fit for it. If you quit to easily, well then you are simply not motivated enough and you would have quit anyway. So if we just forget the introduction of “getting into the hobby for next to nothing” then the project in itself is very interesting. Many people familiar with this area will find your comments quite uneducated. There are multiple reasons for not developing on a the host system; among them are latency issues (where the host OS is busy doing other things and makes the sound glitch – a serious issue in a real time instrument), portability (and, no, a laptop is not that portable – ask any musician who has used VST synths compared to dedicated hardware), cost (20 quid for the main hardware, another 50 or so for case and twiddly knobs/hardware and knocking it off a desk in a busy session is less painful than if it were your 1500 quid laptop; and it would most likely survive, unlike the laptop) and risk of damaging an expensive computer. (see the previous point). SO, the title is very valid. The standard of free soft synths is ZynAddSubFX. It will run on Win and Linux doesn’t take much and has so much to give. It will just about fit on a floppy disc it’s that small. Faster platform just gives more simultaneous notes. Instead of this, Axoloti gets my $$$ .. its a much more viable (also cheap) platform for people to use to discover synthesis .. comes with everything you need to run it standalone, and has an amazing software system to boot. Plus, community! I may give it a whirl with the board sirmanlypowers suggested. I am interested to play around with it but like others have noted a host PC is kinda like bringing a log to hold a stick. Still kudos to pappas.chris for getting things going. It is like having Reason on your phone. Very handy for flights or buses or when you are bored. 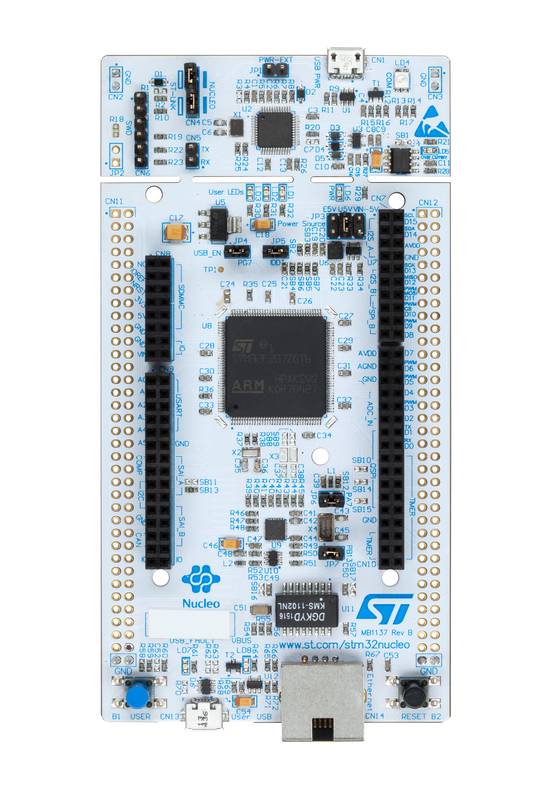 Axoloti would be really cool if the firmware could be easily ported to newer industry-standard boards like the STM Nucleo-F767ZI. I am in the USA, and it is basically impossible to inexpensively order an Axoloti Core board. Shipping is too high, and customs taxes, etc. I see that there is a switch in the firmware code that will produce a build for the old F4-Discovery board, but those boards are old and outdated now. SirManlyPowers is right, the article should have a picture of the STM32 Nucleo-F767ZI board, which is the board that I recommended, not an STM32 F3-Discovery board, which at this point has become another old outdated board (not to mention the fact that the micro-controller doesn’t even contain a DSP core). The NucleoSynth “Host” project is standalone. The PC hookup is only for those who want to modify the software to fit their individual needs and preferences. The NucleoSynth “Device” project is for those who want to use the board as a Midi device, in which case it requires a PC with MIDI Sequencer software to drive it. Here is a link to the picture of the Nucleo_F767ZI. Link to the new community website on STM.